The article reviews the results of a study on the three Abraham religions in the Khazar Khaganate. Judaism. The results of the study of the archaeological evidence of Judaism’s distribution in the Khazar Khaganate were presented in two books (Флёров, Флёрова 2005; Флёров 2012). The only image of menorahs on the territory of the Khaganate was found on a pot from the Donetsk area (Fig. 1). The “rhombus” on which the “candles” were marked as seven small vertical notches raises questions. However, the “seven candles” is an argument supporting the suggestion that it is an image of a menorah. The author believes that the small clum­sily incised oblique cross with equal bars is not related at all to the Christian symbolism. Christianity. The collection of the archeological sources of Christian origin found on the Khazar Kaganate territory was completed with artifacts yielded by the cemeteries at Chervonaya Gussarovka and Verkhneye Saltovo I, IV: cruciform-shaped pendants with a rhombus in the lower part and small-size crosses (Аксёнов 2013, 142, илл. 2) (Fig. 2). A. Aksyonov sees the pendants as a mixture of Christian symbols and pagan amulets. He argues that the common Saltovo-Mayaky people were acquainted with the Christian doctrine and reports about its distribu­tion among the mixed population inhabiting the northwestern parts of the Khazar Khaganate in the second half of the 8th – 9th century. However, his hypothesis is contradicted by the use of the small-size crosses as per­sonal ornaments: twenty small-size crosses (!) were found on a female skeleton in catacomb № 85. Six of them were part of a necklace and fourteen were attached to the lower edge of the dress. Islam. The greatest problem is created by the Muslim burials compactly situated on the territory of the Seversky Donets River between its tributaries Oskol and Derkul Rivers (the Donetsk and Lugansk regions of Ukraine) discovered in the last quarter of the 20th century. These are the cemeteries at Mayaky (Tsarino), Sidorovo (Fig. 3), Novolimarevka, Lysogorovka (Fig. 4), Platonovka (Kravchenko 2005). 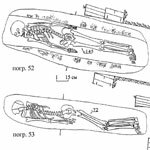 The burial ritual in­cluded narrow grave pits with steps cut into the soil or niches, northwest oriented skeletons laid on the right side and facing Mecca, extended arms and absence of grave goods. These cemeteries yielded the usual Protob­ulgar burials in grave pits. The archaeologists are still not able to explain the arrival of a group Islam believers on the Seversky Donets territory. In any case, it could not have happened without the approval of the central government authorities. It is also specified in the summary that no evidence of Zoroastrianism was found on the territory of the Khazar Khaganate. Y. Zhironkina’s and O. Tsitkovskaya’s suggestion about a Zoroastrianism ritual аt Netailovs­ky (Zhironkina, Tsitkovskaya 2005, 541, 542), probably influenced by their limited archaeological experience, is not based on credible evidence and is supported only by G. E. Afanasiev (Flyorov 2005, 224).